Are more Options what you Crave? Then more Options are what you Get! At Solid State Instruments, our goal is to provide our customers with not only the highest quality and most reliable pulse isolation products available, but also provide a wide variety of selection and customization that lets you get what you really want. 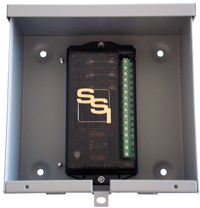 With this in mind, we are excited to announce that the NEMA 3R Enclosure is now available for all SSI small and large modular relays. The NEMA 3R is intended for outdoor use and provides moderate protection against rain and ice formation. This 8x8x4" enclosure meets rod entry, rain, external icing, and rust-resistant design tests. Compared to the NEMA 4X, the NEMA 3R is a lower cost option for outdoor use while still providing great protection! Contact us today to hear more about outdoor enclosure options! Next Article:What are KYZ Pulses?